Just what kind of geek are you? Check the geek type map! 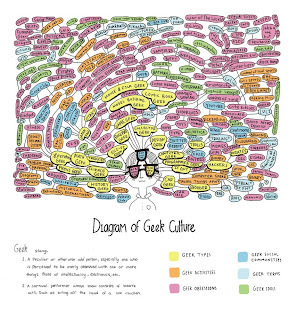 Found this on Gawker (via Twitter), the Geek Type map. Apparently illustrated by Julianna Brion, an illustration major at MICA. Looks like it was an assignment for "Concepts". I'm a huge mind mapping fan, so this speaks to me in all sorts of ways. And for the record, I am somewhere between the Design Geek and the Computer Geek. Which one are you?